A mystery garden starts its journey. . . There was a time. . . when plants and crops were grown in the soil. There was a time when we had to rely on the unpredictable world to be able to sustain ourselves and fight off the various factors of life that would determine whether those ways were successful or not. What if I told that we are at a time when those uncertainties can be harnessed in a controlled environment? We’re not only past such a time of precariousness, but we’re ‘’planting’’ new innovative methods all around the world for society to grow — figuratively speaking. 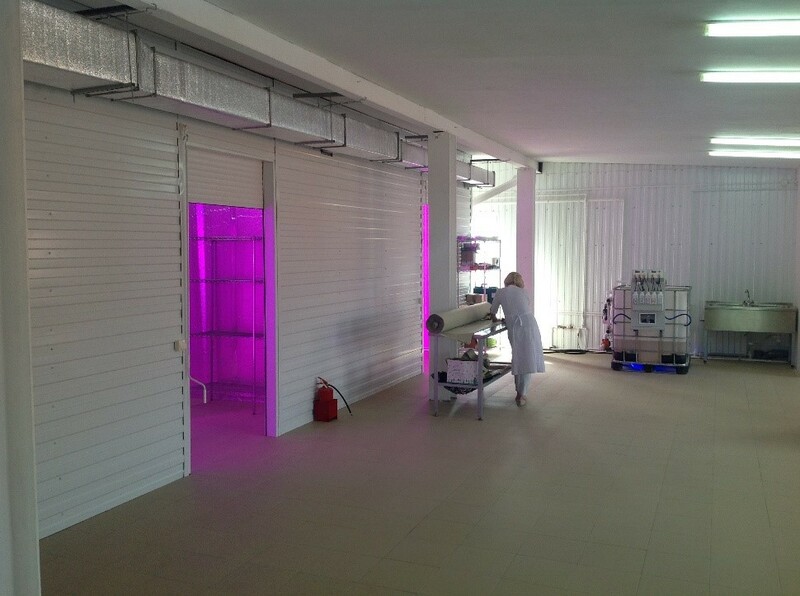 I have been writing extensively about agriculture and hydroponics systems throughout these last months, but as I was writing, I started to hear rumours about a growing venture in Russia with the name of ‘’Healthy Garden’’ that was dwelling deep into uncharted territory of implementing these means of the future. 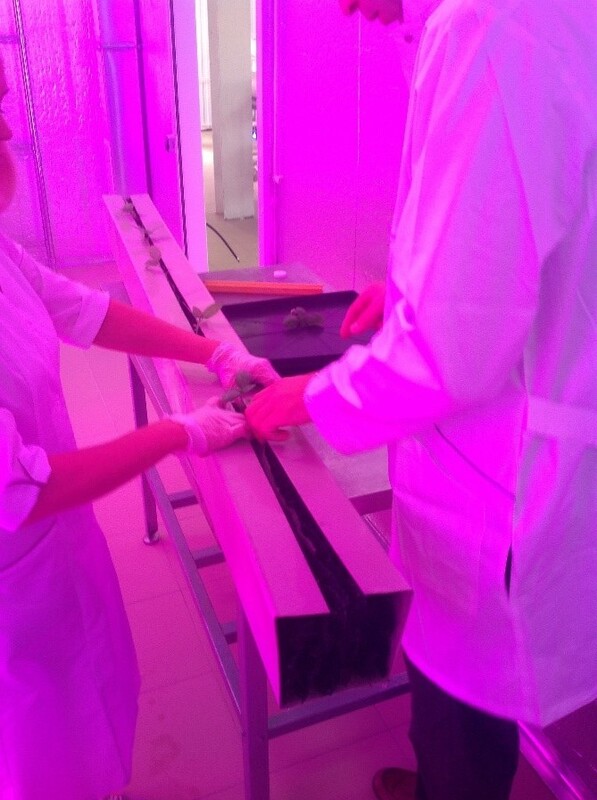 Is Vertical Farming taking off in Russia? ‘’To plant a garden is to believe in tomorrow’’. To the left — where the magic happens. To the right — a team driven to change a city. Upon my arrival to the city itself, I noticed the staggering beauty of the nature-imbued landmarks that stood before me. A statue there. A park here. A perfect symbiosis. A certain greenery and robustness seemed to be ever-present in Cheboksary that stood otherwise sleepy on a Tuesday morning. My guide for the day introduced himself as Pavel — the manager of the venture that was now driving me to the place where all the magic happens, in a location not too far away. Then again, as he assured me — there’s no such thing as ‘’far away’’ in the city of Cheboksary. Out-dated methods improved by modern technology. A thought occurred to me… For many thousands of years, agriculture was the basis for human existence. Life revolved around the home, the village and the fields. The industrial revolution changed both agriculture and the world and it happened in just a few generations. But as we know, change is currently happening at an unprecedented scale. Now, I was standing in a room where change was happening, albeit on a much smaller scale. But that scale was part of an overarching philosophy that is sweeping across the world — Vertical farming and contemporary cultivation techniques that are drastically altering the way we sustain ourselves… and thus concurrently doing the planet a favour. And it keeps growing. . .
Vertical farming IS the future, but we must learn to embrace it. 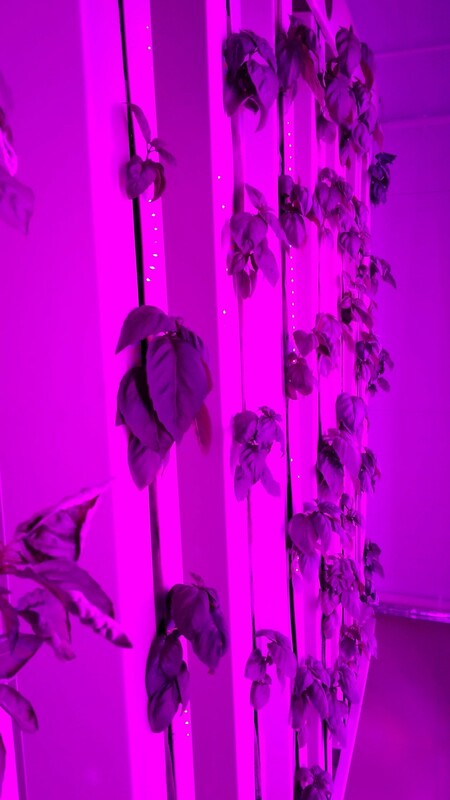 As a reminder, there are various types of vertical farming but many of them fall into the umbrella-term of ‘’hydroponics’’ whereby two principal ones are called aquaponics and aeroponics. But there are others, including NFT, DWC, Media Bed and Bato Bucket. Hydroponics is simply cultivating plants in water and doing so in a way that the roots hang down in an aqueous solution with the necessary nutrients for them to grow efficiently. Aquaponics is a sustainable production system that combines conventional aquaculture (aquatic cultivation such as fish, shellfish or algae in pools) with hydroponics (aquatic plant cultivation) in a symbiotic environment. 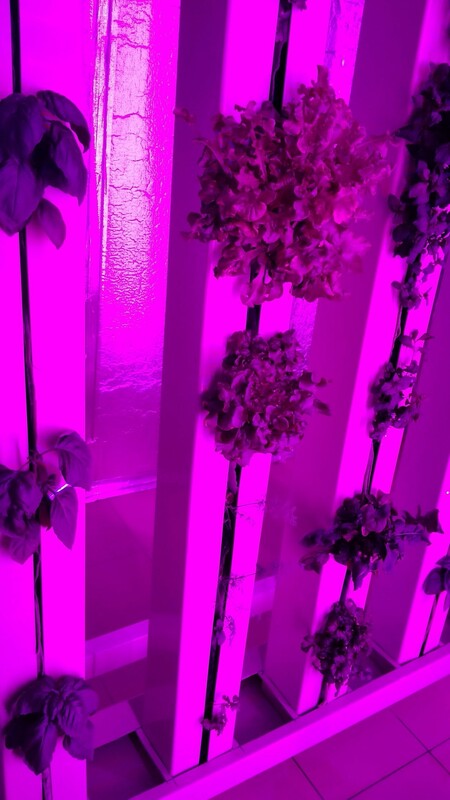 Aeroponics, as I have written extensively about, is all about taking advantage of air and mist, and without using an aggregate medium such as soil, to grow the plants. Healthy Garden, that remains shrouded in mystery and that I was fortunate enough to visit, utilizes contemporary techniques to achieve a sustainable operation. They label themselves as a ‘’high-intensity vertical growth system’’ which includes computer-driven technology to make the magic happen. One of the first things I noticed was Mr. Gordon constantly receiving messages on his phone. ‘’Must be stressful to always be receiving so many e-mails and messages every few seconds’’, I joked. ‘’That’s just the plants speaking to me’’, he replied. ‘’The whole system is connected to an app, and a computer, as well as a programmer sitting in an office not far from here writing lines of code. I receive updates about potential leaks and problems, but I can also change various factors of the process as I see fit’’. I was astounded by the connectedness of this operation. All the parts had a role in this mesmerizing jigsaw puzzle with those same red-blue-dominated lights that to the blind eye appeared violet, created a calming effect. I entered the principal room and, apart from the vibrant colour, what I noticed were these three-meter long stands protruding as pillars enclosing themselves in cables. In equidistant divisions between them and on these stands themselves — were the minuscule yet hopeful plants that were at different stages in their growth, even though the plants themselves were diverse. I could similarly hear a humming in the background as I’m greeted by a woman playing a key part in the clipping of the plants to the stands that, themselves, are connected to the system of cables and solutions. Mr. Gordon took me through every step of the process and explained that the plants currently clipped up to the system would grow to fill up the 10x10 metre room into a ‘’jungle of greenery’’. 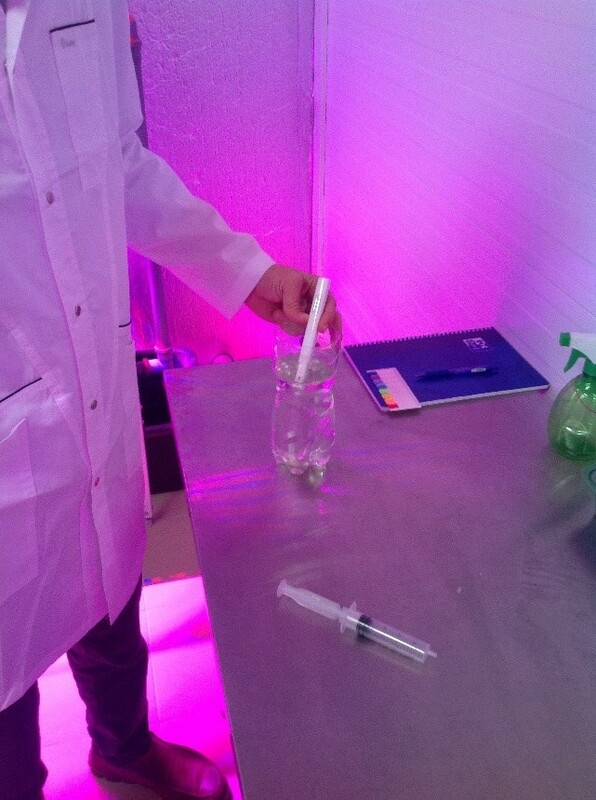 The plants are connected to a source of nutrition, where nutrition and water are consecutively added. Keeping it tidy is important, but the picture below brings a bit of a blessing. 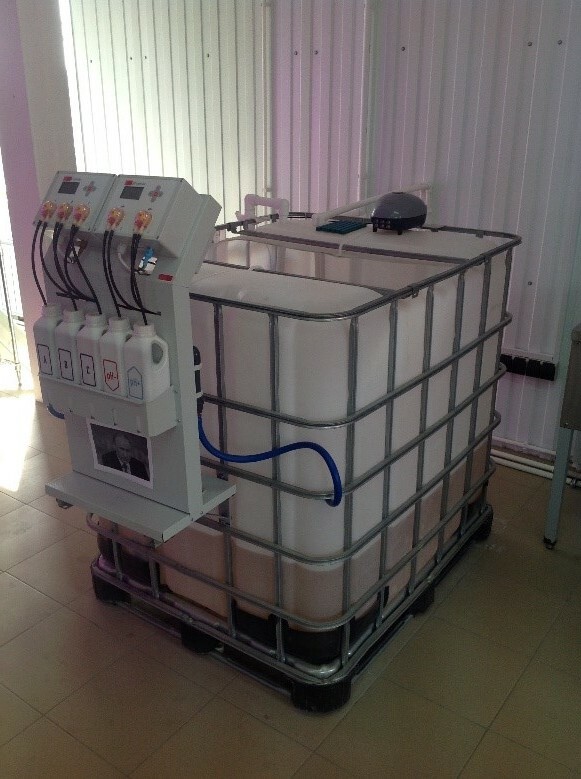 To know how much nutrition and water is to be added, it is matched up to the overarching computer-linked system that reads and adds the exact amount. 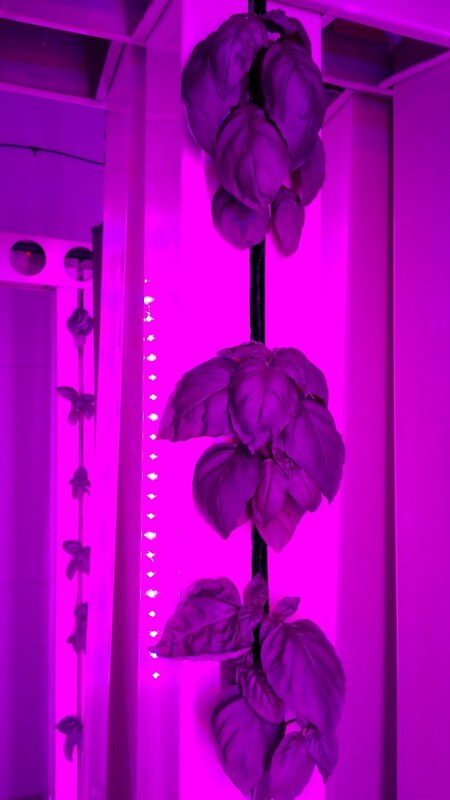 What is common in indoor growing is that the roots are placed in water and the water becomes a part of the irrigation process (which is where leaking problems may occur) but here we have an advanced system that tries to use smaller amounts of nutrient-rich water placed in an area where the climate is controlled. But not only that. Everything is designed in such a way for maximum output with the inputs they have. The programmers that I mentioned earlier? They are constantly improving every stage of the process and as I saw on a computer screen outside the plant-environment, they were changing figures live on the screen while being physically distant away in an office. 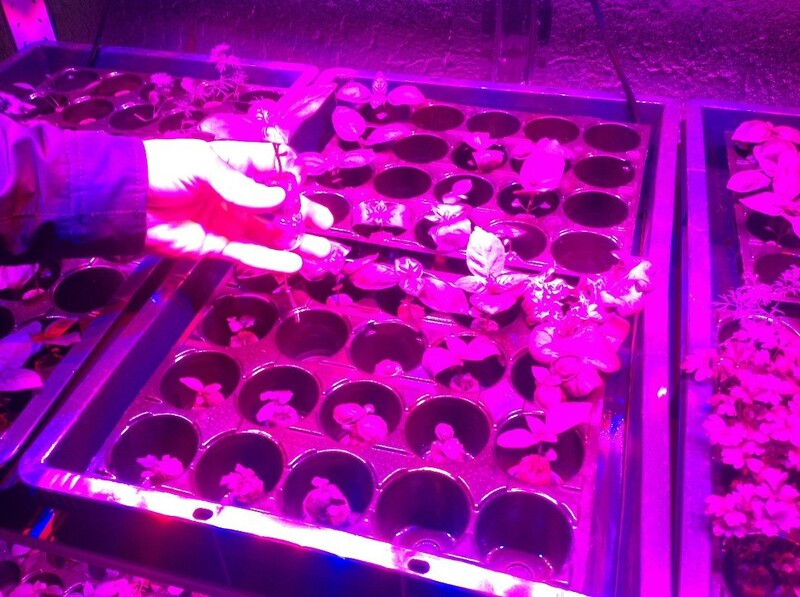 In any cultivation system, sunlight is key — but to simulate natural sunlight, an LED lighting system with the right colours is installed throughout with the right wavelength. Did you think that plants need yellow spectrum? Wrong. With this in mind, they can reduce their entire energy footprint. Coincidentally, it was the Russian botanist Andrei Famintsyn (1835–1918) that was the very first to use artificial light to research and grow plants. 100 years later after his death and this team is continuing the torch-carrying. Although, an actual torch in this case would probably not be a good idea. D for diversity. Many different types of plants are grown here. What’s of benefit in this case, as compared to traditional methods, is that no herbicides and pesticides are used. These can contaminate the soil, water turf and other vegetation. Not to mention that 70% of our fresh water contamination comes from agriculture itself, therefore having none if it is an added plus in the area of cultivation. In another room in the back was where the mysterious climate-control system hid incognito. This sophisticated system is what reduces the growing cycle significantly, which allows for crops to be grown throughout the entire year. 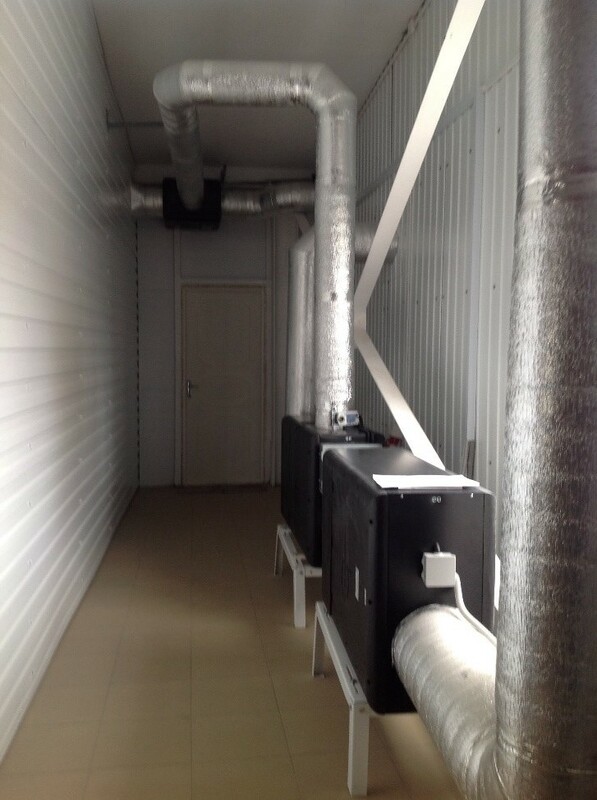 The controlled variables that are of significance in the case of such a system are temperature, humidity and CO2. Getting these aspects right are crucial to the overall process. By getting it wrong, it could slow down the yield or cause unwanted disruptions, thereby having a negative economic effect. Climate-control leading to the main room. But why is Cheboksary proving to be a great location for such a venture? This is precisely what Mr. Gordon commented on as being one of their principal advantages opening up in Russia. Cheboksary and the entirety of Chuvashia are not immune to harsh winters, even though it is located in a moderate continental climate where a January month can reach freezing temperatures. That’s not to mention Russia as an entire country that in parts reach more extreme temperatures than that. The mere fact that they can grow throughout the entire year will have a significant impact on the local industry, and once they get this specific operation up and running, Gordon stated that they could see many more of such operations sprouting up around the country. Figuratively speaking. The economic situation of the region itself is seen as more liberal and progressive in regard to foreign investment due to the regional government. What they perhaps lack in economic development as compared to other regions in Russia, they make up for in opening up to the outside and spurring on creative, but important ventures in the region such as this one. As many interesting discussions as I had with the man behind the project, the addition to the conversation about the future was most exciting. The big picture. The benefits of vertical farming have recently become more discussed. Some critics believe that the environmental benefits of having production close and thus reducing transport do not weigh up to the extra energy that is used to produce the food itself. The energy encompasses heating, artificial lighting and costs related to the site. The latter, Mr. Gordon suggested was low in their case. The energy consumption of the building becomes very different depending on the building management system. However, as always, technologies and methods are improved and implemented, therefore new solutions may be developed which makes production more energy efficient. Until this happens, the amount of energy saved cannot be determined but estimates can always be determined. However, Healthy Garden has relays, sensors installed that save and fix energy consumption. 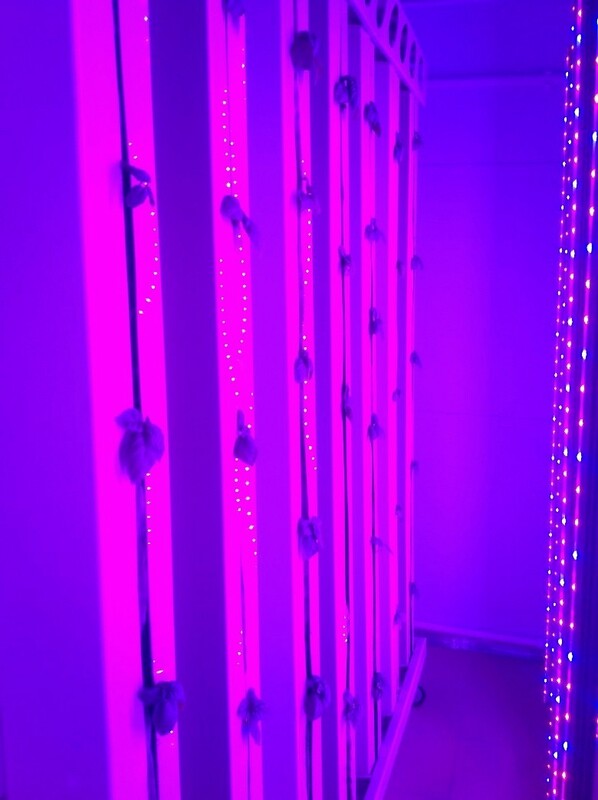 LED lighting uses only the right wavelengths, and relieve production from unnecessary wavelengths, to which farmers normally spend a lot of money. It’s safe to say that Healthy Garden stays on top of these things. What if we compare Vertical Farming to a previously-important piece of technology? An example that has been developed for a long time is the combustion engine. It was previously unthought of that today’s engines could bear fuel systems that make sure that exactly the right amount of air and fuel are used in the combustion process, which makes the engine more efficient in terms of performance and fuel consumption. Vertical farming would ultimately reach the same level of meticulousness. A fitting end to this story — but Healthy Garden will keep growing. . . The world is undoubtedly changing and some of that change is happening in Russia by this mysterious venture in the city of Cheboksary. While I did not stay for a lengthy period, I understood that the drivers of change were deeply intertwined in these leafy plants that were staring me in the face as they protruded from the pillars in the still, violet room. Brightness. If there was one feeling that I could derive from this, it would have to be just that. They’re approaching a time when they can make use of these hi-tech systems and make an impact on the city, the region and the country. ‘’Let us not forget that the cultivation of the earth is the most important labor of man. When tillage begins, other arts will follow. The farmers, therefore, are the founders of civilization’’. While we may not be in dire of need of a lot of ‘’laborers’’ in such an operation — we need out-of-box thinking and that is precisely what I have gathered from this motivated team. Pavel Gordon and Mikhail Bolotin are showing this way forward, and the developments that come from the Healthy Garden venture will be of interest to various stakeholders in the region and beyond. 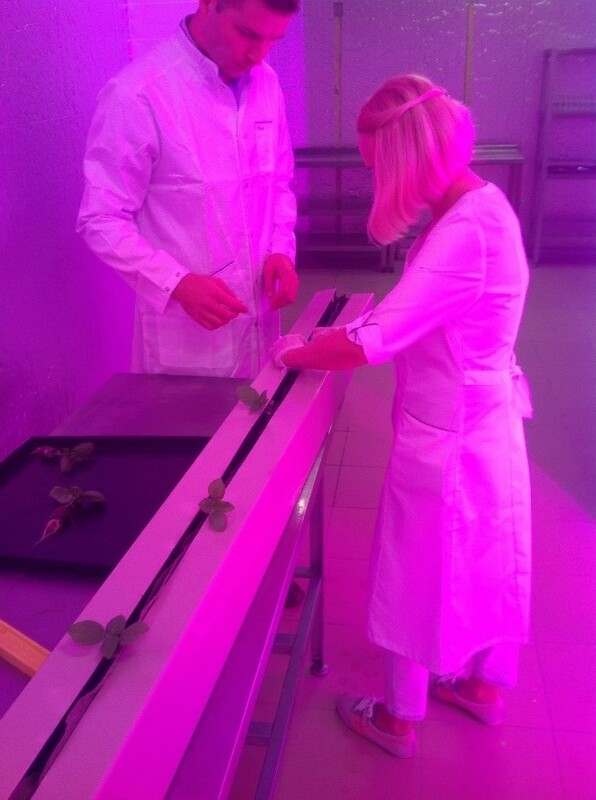 Will they be the first to firmly establish themselves in Russia as a top player in vertical farming? The question is not if, but when.